Welcome to Premium Contractor Supply. We provide the most popular products and brands for the Commercial Building, Heavy Industrial, and Manufacturing Trades. You will benefit from an expanded resource of knowledgeable professionals who specialize in specific areas and understand the demands of your applications. Premium Contractor Supply takes pride in our professionalism, supplying you with your product needs on-time, and introducing new innovative products. We look forward to helping your projects be a huge success. 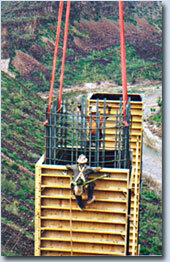 Ironworkers from Primo International Burro Creek Bridge, AZ US 93.